AMMAN, Jordan (CNS) — Raising olive branches, Christians from Catholic and Orthodox congregations crowded into a packed church in the Jordanian capital and sang the Lord’s Prayer together in Arabic. Although the prayer service the evening of Jan. 21 at the Syriac Orthodox Cathedral of St. Ephraim urged Christian unity, the violence raging next door in Syria and the plight of millions of displaced Syrians were foremost in people’s minds. “We pray for God’s peace to reign in Syria, Iraq, Egypt, Jordan and our region. We lift up our brothers and sisters,” Syrian Orthodox Bishop Sawiris Malki Murad said. “God is love. God is our life. Encourage Christians in Syria and throughout the Middle East in their faith as they face enormous difficulties and challenges,” said the bishop, who is responsible for Syriac Orthodox Christians in Jordan and Jerusalem. The plea came as minority Christian communities increasingly encounter threats, persecution and sometimes death in their ancient homelands as three years of upheavals that saw longtime rulers toppled in the Arab Spring uprisings reverberate. The prayers were being offered, too, as peace talks between the warring sides in Syria’s civil war opened in the Swiss town of Montreux after months of diplomatic wrangling. Dubbed Geneva II, the talks aim for a transitional government, an end to the violence and the delivery of badly needed humanitarian aid. Syria’s nearly three-year civil war has led to what the U.N. calls the “greatest humanitarian crisis in modern history.” It said that by the end of 2013, more than 130,000 people, mostly civilians, were thought to have died and tens of thousands more had been arrested. More than 2.5 million Syrians are refugees and more than double that number need aid inside the country. 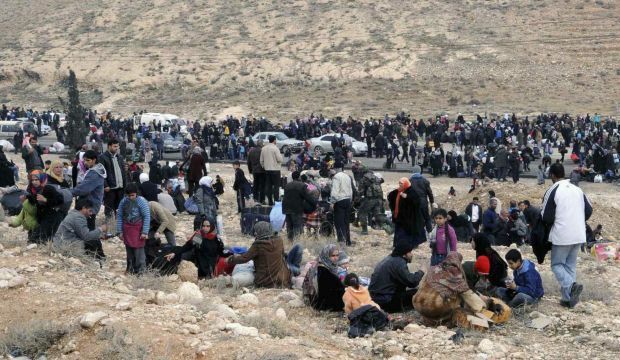 Jordan shelters about 600,000 Syrian refugees registered with the United Nations, although the government puts the number at about 1 million. Tiny Lebanon hosts the most Syrians at more than 1 million. Expectations among displaced Syrians for a peaceful outcome in Geneva were low, however. “Of course, the Geneva II talks must happen. But how will the extremist groups threatening Christians and other Syrians inside the country be dealt with?” asked Abu Reda, who said he was Catholic. Reda’s extended family was forced to flee to Jordan after he and other members were threatened with death a few months ago by the Islamist al-Nusra Front warring against the regime of President Bashar Assad. Al-Qaida-linked groups such as the al-Nusra Front and the Islamic State of Iraq are not part of the Geneva talks largely because they have said they will not be bound by any agreement. Church officials and rights groups say that many Christians have tried to remain neutral in Syria’s conflict. But fighting continues to put pressure on the small Christian population, leading to fears that more Syrian Christians will join those who already have left the Middle East, noted the Catholic Near East Welfare Association. Other Syrian refugees said they are disillusioned and feel the talks will not see Assad removed. Indeed, the Syrian government has said that Assad will remain in power. The regime and its conference sponsor, Russia, seem bent on wanting to turn the talks into a meeting on how to fight terrorism. Such a focus would fall short of dealing with what many say is Assad’s responsibility for allowing Syria to descend into civil war by choosing a military solution over a negotiated settlement with peaceful protesters at the start of the uprising in March 2011. The latter option was advocated by some high-level members of Assad’s own government and political party as well as advisers such as Yahya al-Aridi, a former negotiator in Syrian peace talks with Israel and ex-faculty dean at Damascus University. The U.S. and Russia, as the sponsors of Geneva II, “should exert a serious effort to end this catastrophic situation the Syrian people are going through … stop the violence, and come to their rescue,” said al-Aridi, who with his family fled to Jordan. A report by international prosecutors released Jan. 20 said Syrian officials could face war crime charges based on pictures taken by a military police photographer who defected. The photographs, they said, show “industrial scale” torture and killings of 11,000 detainees by the Assad regime reminiscent of the starvation, strangulation and beatings in Nazi death camps in World War II Germany. “One of the basic cards in the hands of the regime is violence and when this card is taken away, this terrorism talked about will end,” added al-Aridi, who now teaches at the American University in Madaba, Jordan. A member of Syria’s minority Druze community, al-Aridi studied for his master’s and doctorate degrees in linguistics and communications at Georgetown University. He said his experience at the Jesuit institution deeply affected his beliefs. Jesuit Father Peter Balleis, international director of Jesuit Refugee Service, joined representatives from 25 humanitarian agencies Jan. 15 in appealing to Great Britain to open its doors to Syrians fleeing the violence. The agency leaders said it was unfair to Syria’s neighbors to keep their borders open to refugees if other countries keep their own under lock and key. Still, there are refugees in Jordan who believe that only force, not talks, will lead to Assad’s ouster. “Yes, Assad is still around, but he will be destroyed,” said 15-year-old Khaled, a native of the southern town of Daraa, where the Syrian uprising began, who now works long hours hauling fruit and vegetables at an outdoor market in Amman. “The day is coming when he will be removed,” said the boy, who was forced to leave school to support 10 family members who fled to Jordan. But for others like al-Aridi, the Geneva II meeting offers a glimmer of hope. “If it fails,” he warned, it will not only be at Syria’s detriment, but this will be seen as “the failure of the international community and will also negatively impact the U.N.” To be sure, he said, the suffering of millions of Syrians will continue and hopes for their future will further erode.